Want to increase your chances of landing a job after graduation? Go see the world. A recent study investigating the impact of mobility on employability, skills development, institutional development and the internationalization of higher education institutions in Europe has shown that students who study abroad have a better shot at finding a job after graduation than those who don’t. 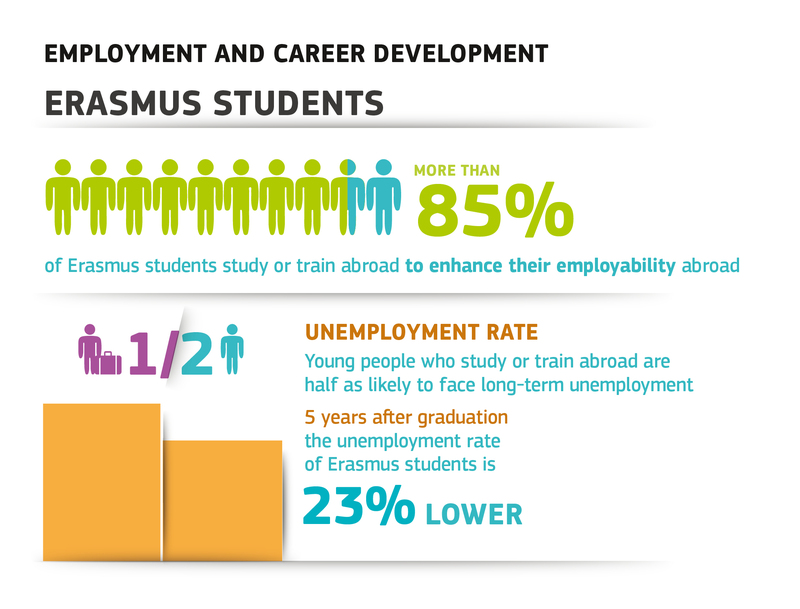 On average, Erasmus students were more likely to get a job after studying abroad than 70% of all students. Based on their personality traits as well, the study showed they had a better predisposition for employability even before going abroad. By the time they returned to their country of origin they increased their advantage by 42%, with 81% of them perceiving an improvement in their soft skills, such as team work or familiarity with office software. According to the study, 64% of employers consider international experience as important for recruiting, reporting that graduates with an international background receive greater professional responsibility more often. Of the employers questioned, 92% said they preferred their recruits to have soft (or transversal) skills; 91% said they prioritized knowledge of the field and 78% felt relevant work experience was most important. Other interesting findings were that more than 1 in 3 Erasmus students who took a job placement abroad were hired or offered a position by their host company, and 1 in 10 started their own company. On top of this, the unemployment rate of Erasmus students five years after graduation is 23% lower than the norm. Can we make international study open to all?